A forest is a type of ecosystem in which there is high density of trees occupying a relatively large area of land. An ecosystem is an ecological unit consisting of a biotic community (an assemblage of plant, animal, and other living organisms) together with its abiotic environment (such as soil, rocks, water, temperature, slope of the land, etc.). In the case of a forest, trees dominate the biotic landscape, although there are also other plants and animals. 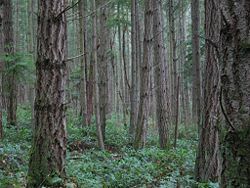 There are many types of forest, such as rainforests and temperate hardwood forest. There are many definitions of a forest, based on various criteria (Lund 2006). These plant communities cover large areas of the globe and function as habitats for organisms, hydrologic flow modulators, and soil conservers, constituting one of the most important aspects of the Earth's biosphere. Historically, "forest" meant an uncultivated area legally set aside for hunting by feudal nobility, and these hunting forests were not necessarily wooded much, if at all. However, as hunting forests did often include considerable areas of woodland, the word forest eventually came to mean wooded land more generally. Forests provide innumerable values to people, provide aspects that address both physical needs (shelter, food, etc.) as well as the internal nature of people (beauty, diversity of animals and plants, recreation, etc.) Some of the values of forests can be converted to commercial value, with trees providing timber for construction and housing, paper, firewood, and so forth. The selling of timber allows an economic valuation to be established. However, for many of the benefits offered by forests, it would be difficult to compute the economic value. These benefits include climate control, ecological values, water retention, and aesthetic, peace of mind, and recreational values. 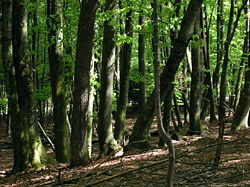 A deciduous broadleaf (Beech) forest in Slovenia. A forest on San Juan Island in Washington. Maple and Oak (broadleaf, deciduous) forest in Wisconsin during winter. Forests can be found in all regions capable of sustaining tree growth, at altitudes up to the tree line, except where natural fire frequency is too high, or where the environment has been impaired by natural processes or by human activities. The tree line or timberline is the edge of the habitat at which trees are capable of growing; beyond the tree line, they are unable to grow due to inappropriate environmental conditions. As a general rule, forests dominated by angiosperms (broadleaf forests) are more species-rich than those dominated by gymnosperms (conifer, montane, or needleleaf forests), although exceptions exist (for example, species-poor aspen and birch stands in northern latitudes). Forests sometimes contain many tree species within a small area (as in tropical rainforests and temperate deciduous forests), or relatively few species over large areas (e.g., taiga and arid montane coniferous forests). Forests are often home to many animal and plant species, and biomass per unit area is high compared to other vegetation communities. Much of this biomass occurs below-ground in the root systems and as partially decomposed plant detritus. The woody component of a forest contains lignin, which is relatively slow to decompose compared with other organic materials such as cellulose or carbohydrate. Forests are differentiated from woodlands by the extent of canopy coverage: in a forest the branches and foliage of separate trees often meet or interlock, although there can be gaps of varying sizes within an area referred to as forest. A woodland has a more continuously open canopy, with trees spaced further apart, which allows more sunlight to penetrate to the ground between them. Redwood tree in northern California redwood forest, where many redwood trees are managed for preservation and longevity, rather than harvest for wood production. The scientific study of forest species and their interaction with the environment is referred to as forest ecology, while the management of forests is often referred to as forestry. Forest management has changed considerably over the last few centuries, with rapid changes from the 1980s onwards culminating in a practice now referred to as sustainable forest management. Forest ecologists concentrate on forest patterns and processes, usually with the aim of elucidating cause and effect relationships. Foresters who practice sustainable forest management focus on the integration of ecological, social, and economic values, often in consultation with local communities and other stakeholders. Anthropogenic factors that can affect forests include logging, human-caused forest fires, acid rain, and introduced species, among other things. For example, the gypsy moth, when introduced into North America from Eurasia, defoliated huge amounts of forest: Over 1 million acres (4,000 km²) of forest each year were defoliated between 1980 and 1991, and in 1981 almost 13 million acres were defoliated (52,200 km²) (McManus et al. 1992). There are also many natural factors that can also cause changes in forests over time including forest fires, insects, diseases, weather, competition between species, and so forth. In 1997, the World Resources Institute recorded that only 20 percent of the world's original forests remained in large intact tracts of undisturbed forest Bryant et al. 1997). More than 75 percent of these intact forests lay in three countries: the Boreal forests of Russia and Canada, and the rainforest of Brazil. Canada has about 4,020,000 km² of forest land. More than 90 percent of forest land is publicly owned and about 50 percent of the total forest area is allocated for harvesting. These allocated areas are managed using the principles of sustainable forest management, which includes extensive consultation with local stakeholders. In the United States, most forests have historically been affected by humans to some degree, though in recent years improved forestry practices has helped regulate or moderate large scale or severe impacts. However the United States Forest Service estimates that every year about 6,000 km² (1.5 million acres) of the nation’s 3,000,000 km² (750 million acres) of forest land is lost to urban sprawl and development. It is expected that the South alone will lose 80,000 to 100,000 km² (20 to 25 million acres) to development. However, in many areas of the United States, the area of forest is stable or increasing, particularly in many northern states. Forests can be classified in different ways and to different degrees of specificity. One such way is in terms of the "biome" in which they exist, combined with leaf longevity of the dominant species (whether they are evergreen or deciduous). Another distinction is whether the forest is composed predominantly of broadleaf trees, coniferous trees, or mixed. Boreal forests occupy the subarctic zone and are generally evergreen and coniferous. Temperate zones support both broadleaf deciduous forests (e.g., temperate deciduous forest) and evergreen coniferous forests (e.g., Temperate coniferous forests and Temperate rainforests). Warm temperate zones support broadleaf evergreen forests, including laurel forests. Tropical and subtropical forests include tropical and subtropical moist forests, tropical and subtropical dry forests, and tropical and subtropical coniferous forests. Physiognomy classifies forests based on their overall physical structure or developmental stage (e.g. old growth vs. second growth). Forests can also be classified more specifically based on the climate and the dominant tree species present, resulting in numerous different forest types (e.g., ponderosa pine/Douglas-fir forest). A number of global forest classification systems have been proposed but none has gained universal acceptance (Jenkins and Groombridge 2007). A forest category classification has been developed by the United Nations Environment Program (UNEP) and the World Conservation Monitoring Center (WCMC). The UNEP-WCMC forest category classification system is a simplification of other more complex systems (e.g. UNESCO's forest and woodland "subformations"). This system divides the world's forest into 26 major types, which reflect climatic zones as well as the principal types of trees. Temperate needleleaf forests mostly occupy the higher latitude regions of the northern hemisphere, as well as high altitude zones and some warm temperate areas, especially on nutrient-poor or otherwise unfavorable soils. 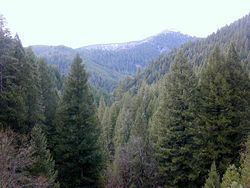 These forests are composed entirely, or nearly so, of coniferous species. In the Northern Hemisphere, pines ''Pinus'', spruces ''Picea'', larches ''Larix'', silver firs ''Abies'', Douglas firs ''Pseudotsuga'', and hemlocks ''Tsuga'', make up the canopy, but other taxa are also important. In the southern hemisphere, mostly coniferous trees, members of the Araucariaceae and Podocarpaceae, occur in mixtures with broadleaf species that are classed as broadleaf and mixed forests. Temperate broadleaf and mixed forests include a substantial component of trees in the Anthophyta. They are generally characteristic of the warmer temperate latitudes, but extend to cool temperate ones, particularly in the southern hemisphere. They include such forest types as the mixed deciduous forests of the United States and their counterparts in China and Japan, the broadleaf evergreen rain forests of Japan, Chile, and Tasmania, the sclerophyllous forests of Australia, the Mediterranean and California, and the southern beech Nothofagus forests of Chile and New Zealand. Tropical moist forests include many different forest types. The best known and most extensive are the lowland evergreen broadleaf rainforests include, for example: the seasonally inundated varzea and igapó forests and the terra firme forests of the Amazon Basin; the peat forests and moist dipterocarp forests of Southeast Asia; and the high forests of the Congo Basin. The forests of tropical mountains are also included in this broad category, generally divided into upper and lower montane formations on the basis of their physiognomy, which varies with altitude. The montane forests include cloud forest, those forests at middle to high altitude, which derive a significant part of their water budget from cloud, and support a rich abundance of vascular and nonvascular epiphytes. Mangrove forests also fall within this broad category, as do most of the tropical coniferous forests of Central America. Tropical dry forests are characteristic of areas in the tropics affected by seasonal drought. 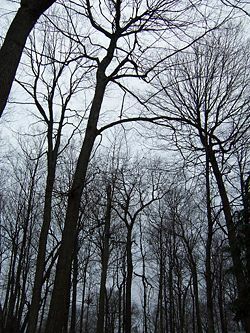 The seasonality of rainfall is usually reflected in the deciduousness of the forest canopy, with most trees being leafless for several months of the year. However, under some conditions, such as less fertile soils or less predictable drought regimes, the proportion of evergreen species increases and the forests are characterized as "sclerophyllous." Thorn forest, a dense forest of low stature with a high frequency of thorny or spiny species, is found where drought is prolonged, and especially where grazing animals are plentiful. On very poor soils, and especially where fire is a recurrent phenomenon, woody savannas develop. Sparse trees and parkland are forests with open canopies of 10-30 percent crown cover. They occur principally in areas of transition from forested to non-forested landscapes. The two major zones in which these ecosystems occur are in the boreal region and in the seasonally dry tropics. At high latitudes, north of the main zone of boreal forest or taiga, growing conditions are not adequate to maintain a continuous closed forest cover, so tree cover is both sparse and discontinuous. This vegetation is variously called open taiga, open lichen woodland, and forest tundra. It is species-poor, has high bryophyte cover, and is frequently affected by fire. Forest plantations, generally intended for the production of timber and pulpwood increase the total area of forest worldwide. Commonly mono-specific and/or composed of introduced tree species, these ecosystems are not generally important as habitat for native biodiversity. However, they can be managed in ways that enhance their biodiversity protection functions and they are important providers of ecosystem services, such as maintaining nutrient capital, protecting watersheds and soil structure, as well as storing carbon. They may also play an important role in alleviating pressure on natural forests for timber and fuelwood production. Twenty-six forest categories in the UNEP-WCMC system are used to enable the translation of forest types from national and regional classification systems to a harmonized global one. Note that categories 12 and 13 below have been created as a result of data holdings that do not specify the forest type, hence 26 categories are quoted, not 28 shown here (UNEP 2007). 1 Evergreen needleleaf forest - Natural forest with greater than 30 percent canopy cover, in which the canopy is predominantly (> 75 percent) needleleaf and evergreen. 2 Deciduous needleleaf forest - Natural forests with greater than 30 percent canopy cover, in which the canopy is predominantly (> 75 percent) needleleaf and deciduous. 3 Mixed broadleaf/needleleaf forest - Natural forest with greater than 30 percent canopy cover, in which the canopy is composed of a more or less even mixture of needleleaf and broadleaf crowns (between 50:50 percent and 25:75 percent). 4 Broadleaf evergreen forest - Natural forests with greater than 30 percent canopy cover, the canopy being > 75 percent evergreen and broadleaf. 5 Deciduous broadleaf forest - Natural forests with greater than 30 percent canopy cover, in which > 75 percent of the canopy is deciduous and broadleaves predominate (> 75 percent of canopy cover). 6 Freshwater swamp forest - Natural forests with greater than 30 percent canopy cover, composed of trees with any mixture of leaf type and seasonality, but in which the predominant environmental characteristic is a waterlogged soil. 7 Sclerophyllous dry forest - Natural forest with greater than 30 percent canopy cover, in which the canopy is mainly composed of sclerophyllous broadleaves and is > 75 percent evergreen. 8 Disturbed natural forest - Any forest type above that has in its interior significant areas of disturbance by people, including clearing, felling for wood extraction, anthropogenic fires, road construction, etc. 9 Sparse trees and parkland - Natural forests in which the tree canopy cover is between 10-30 percent, such as in the steppe regions of the world. Trees of any type (e.g., needleleaf, broadleaf, palms). 10 Exotic species plantation - Intensively managed forests with greater than 30% canopy cover, which have been planted by people with species not naturally occurring in that country. 11 Native species plantation - Intensively managed forests with greater than 30 percent canopy cover, which have been planted by people with species that occur naturally in that country. 12 *Unspecified forest plantation - Forest plantations showing extent only with no further information about their type, This data currently only refers to the Ukraine. 13 *Unclassified forest data - Forest data showing forest extent only with no further information about their type. 14 Lowland evergreen broadleaf rain forest - Natural forests with greater than 30 percent canopy cover, below 1,200 meter altitude that display little or no seasonality, the canopy being >75 percent evergreen broadleaf. 15 Lower montane forest - Natural forests with greater than 30 percent canopy cover, between 1,200-1,800 meter altitude, with any seasonality regime and leaf type mixture. 16 Upper montane forest - Natural forests with greater than 30 percent canopy cover, above 1,800 meter altitude, with any seasonality regime and leaf type mixture. 17 Freshwater swamp forest - Natural forests with greater than 30 percent canopy cover, below 1,200 m altitude, composed of trees with any mixture of leaf type and seasonality, but in which the predominant environmental characteristic is a waterlogged soil. 18 Semi-evergreen moist broadleaf forest - Natural forests with greater than 30 percent canopy cover, below 1,200 meter altitude in which between 50-75 percent of the canopy is evergreen, more than 75 percent are broadleaves, and the trees display seasonality of flowering and fruiting. 19 Mixed broadleaf/needleleaf forest - Natural forests with greater than 30 percent canopy cover, below 1,200 meter altitude, in which the canopy is composed of a more or less even mixture of needleleaf and broadleaf crowns (between 50:50 percent and 25:75 percent). 20 Needleleaf forest - Natural forest with greater than 30 percent canopy cover, below 1,200 meter altitude, in which the canopy is predominantly (> 75 percent) needleleaf. 21 Mangroves - Natural forests with > 30 percent canopy cover, composed of species of mangrove tree, generally along coasts in or near brackish or salt water. 22 Disturbed natural forest - Any forest type above that has in its interior significant areas of disturbance by people, including clearing, felling for wood extraction, anthropogenic fires, road construction, etc. 23 Deciduous/semi-deciduous broadleaf forest - Natural forests with greater than 30% canopy cover, below 1,200 meter altitude in which between 50-100 percent of the canopy is deciduous and broadleaves predominate (> 75 percent of canopy cover). 24 Sclerophyllous dry forest - Natural forests with greater than 30 percent canopy cover, below 1,200 meter altitude, in which the canopy is mainly composed of sclerophyllous broadleaves and is more than 75 percent evergreen. 25 Thorn forest - Natural forests with greater than 30 percent canopy cover, below 1,200 meter altitude, in which the canopy is mainly composed of deciduous trees with thorns and succulent phanerophytes with thorns may be frequent. 26 Sparse trees and parkland - Natural forests in which the tree canopy cover is between 10-30 percent, such as in the savannah regions of the world. Trees of any type (e.g., needleleaf, broadleaf, palms). 27 Exotic species plantation - Intensively managed forests with greater than 30 percent canopy cover, which have been planted by people with species not naturally occurring in that country. 28 Native species plantation - Intensively managed forests with greater than 30 percent canopy cover, which have been planted by people with species that occur naturally in that country. Bryant, D. G., D. Nielsen, L. Tangley, and Forest Frontiers Initiative (World Resources Institute). 1997. The Last Frontier Forests: Ecosystems and Economies on the Edge. Washington, DC: World Resources Institute, Forest Frontiers Initiative. ISBN 1569731985. Jenkins, M. D., and B. Groombridge. 2007. World Atlas of Biodiversity: Earth's Living Resources in the 21st Century. World Conservation Monitoring Centre, United Nations Environment Programme. Retrieved March 20, 2007. Lund, H. G. (Coord.) 2006. Definitions of Forest, Deforestation, Afforestation, and Reforestation. Gainesville, VA: Forest Information Services. Retrieved December 22, 2007. McManus, M., N. Schneeberger, R. Reardon, and G. Mason. 1992. Gypsy moth. Forest Insect & Disease Leaflet 162, U.S. Department of Agriculture Forest Service. Retrieved December 20, 2007. Science Daily. 2007. 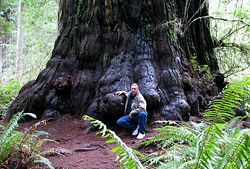 2006-01-13, Deep-rooted Plants Have Much Greater Impact On Climate Than Experts Thought. Science Daily January 13, 2006. Retrieved December 22, 2007. United Nations Environment Programme, World Conservation Monitoring Centre, Background to Forest Mapping & Data Harmonization. UNEP. Retrieved March 20, 2007. Global Forest Resources Assessment 2005 by the FAO. This page was last modified on 19 April 2017, at 15:29.